How do you do this in screen printing? Is it the same as 4 colour printing? Think back to school when you were painting and used blue and yellow to get green, that is the theory of the whole process. It is used all over the place and you will see the little symbol on things you use every day! I don’t want you to rely on pictures too much because your screen or printer will subtly alter these colours. 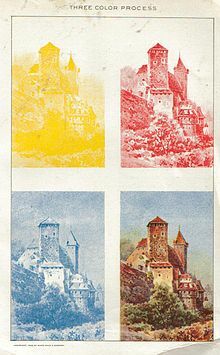 But have a look at this picture from Wiki to get an idea, yes basically it is just like school blue, red and yellow. Now as you no doubt remember from school, combining them does give a murky black which is no good for our purposes which is why we have to have black. Saves ink as well. So that is the inks but how does it work. Well you put the 4 colours onto the substrate (thing you are printing on) in dots and when the dots are on top of each other you get the various colours and your picture. Now remember the way screen printing works, the ink is pushed through the mesh in dots! The finer the mesh the closer together the dots are so you can’t see the background colour. Basically your brain has the illusion into thinking you see a solid colour when in fact what you see is lots of dots. All screen printing works on that principle. 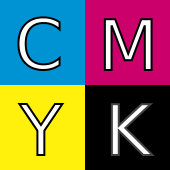 The ink is normally applied in that colour order Cyan, Magenta, Yellow, Black although that can vary with some printers. There is actually a principle behind the process called “subtractive”. Because you are printing on white, you are subtracting, with the inks, the amount of white(brightness) your eye sees. Now if you don’t fill in all the dots you get to see more white and that gives you paler colours, which can also be mixed and matched to get the full range. This bit is called “half tones”. Honestly the principle is as simple as that, any water colour artist would see it immediately although they may not know what it is called. 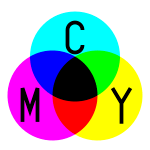 You have to separate your final image artwork into its CMYK elements. If you check Photoshop all the colours show what percentage of these colours comprise the colour you see. 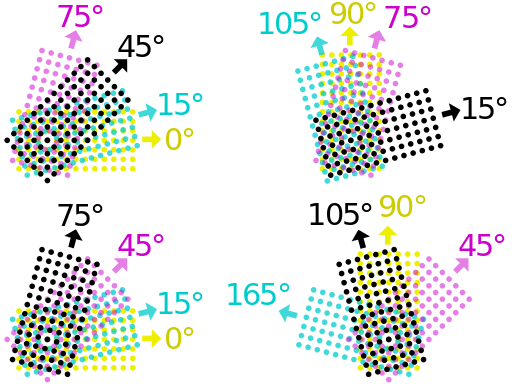 Photoshop automatically separates the CMYK colors into channels. Just open the channels palette and select “split channels” from the palettes flyout panel options. You will get four grayscale files, one for each channel. So you need 4 screens that have the required separate colours which when combined will give your final picture. Be aware, however, that this is NOT how you separate artwork for screen printing. 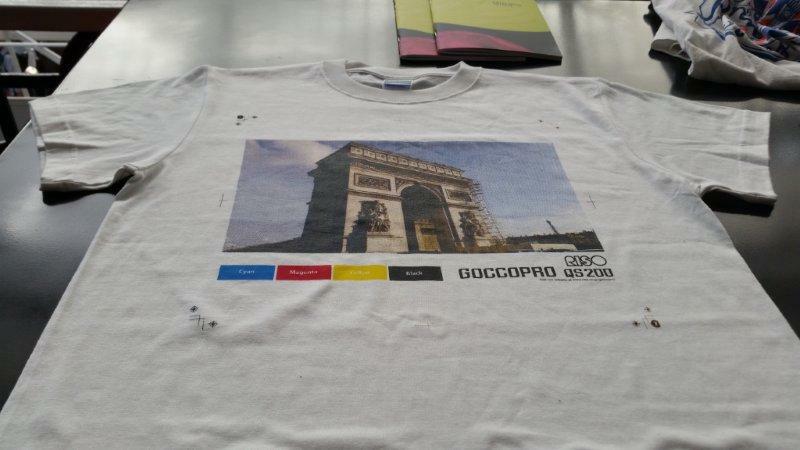 If you are printing the job as a 4 color process on white shirts, all you want are printouts of the separate channels, just print the file as “separations” with a course line screen (35 to 55 lpi) and the following angles – C: 55 degrees, M: 22 degrees, Y: 5 degrees, K: 80 degrees. Not doing this right gives you the Moire effect (it looks blurred). Other angles can be used for example. There are literally nearly 80,000 videos on the internet describing exactly how to do this and I suggest you watch a few, several times until you feel completely confident you understand the process. This pack contains all of the essentials you need to try out the fantastic Trutone process inks at an affordable price. As ever we are completely happy to give you the benefit of our 30 years of experience so please contact us with any questions. Here is an example of a finished product, the screens were produced using the Riso QS200.